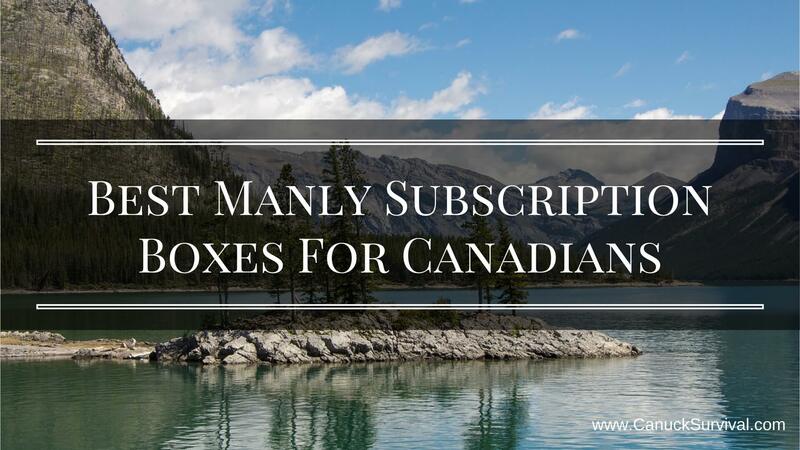 I’m sure you’ve heard of monthly subscription boxes such as Dollar Shave Club and many others, but I wanted to find the best manly subscription boxes for Canadians related to the outdoors. To make the list the subscription box needs to include cool gear at a great price (aka no crazy shipping charges). After extensive research I reveal the top three monthly subscription boxes that ship to Canada and pack great outdoor gear and supplies. For each review I specify the type of gear, when it ships, and the minimum and maximum monthly investment. Gear Pack is Canadian based (yay!) and so far the only Canadian company I can find to offer a monthly subscription box for outdoor gear. It seems the US gets all the cool stuff. I’m glad I found Gear Pack because I’m always worried about cross-border shipping, especially when there’s potentially knives and other hardware in the box. The benefit of shipping within Canada is obviously no border control, and dealing in Canadian Dollars. Previous Gear Pack months included your camping basics, water, food, and fire. I’m sad I didn’t find out about Gear Pack earlier to take advantage of those previous months. Gear Pack is a fun and affordable way to collect your gear. An added bonus with Gear Pack is they have a monthly giveaway that all active subscribers are automatically entered into. It’s always good to see a company give back to paying members. The cutoff for ordering your box is the 5th of each month. All boxes are then shipped at the same time between the 20th and 25th of that same month. Gear Pack lets you choose between four box sizes, Basic, Basic Plus, Advanced, and Ultimate. I opted for the Basic Box to get things started. Check out my full review here. I’ve been charged $14.91 for shipping since it’ll be coming from BC to Ontario. Sportsman’s Box ships exclusively to the US and Canada. Unlike Gear Pack, which has a wide range of product types, Sportsman’s Box is strictly for hunters and fishers. If you have no plans of doing either this subscription is not for you. Each box has an item from each of four categories, Apparel, Gear, Food, and Discover. They guarantee that each box will have up to $70 of value each month. Check out the previous boxes and watch their slightly cheesy video to get a better idea of Sportsman’s Box hunting and fishing boxes. You can order anytime, the boxes are shipped out on the 10th of every month. If it’s your very first order as a new customer they’ll ship the box right away so you won’t have to wait. Sportsman’s Box has only one style of box per month, unlike Gear Pack which has Basic to Ultimate (the more you pay the more you get). Sportsman’s Box allows you to buy monthly subscriptions in advanced for a discounted rate. Prices in USD and include shipping anywhere in the US. Shipping is calculated for Canadians at checkout. If you aren’t sure if Sportsman’s Box is for you, you can order a one month membership and cancel before it auto-renews, or better yet send yourself a gift box. By using the gift box option the subscription does not auto renew. It also gives you a chance to send a box to someone who you know will enjoy it. Cairn is another great choice to get your manly gear each month. Cairn approaches the monthly subscription box with a bit of a twist. They feature their own apparel store separate from the subscription box. What’s neat about this is that you can earn points towards the merchandise and discounts on your boxes by referring friends and performing various tasks, such as reviewing the products you receive. Cairn provides products that anyone who spends any amount of time outdoors will enjoy. Not only that but each month they hold contests with select brands to giveaway to a lucky active subscriber. They call this the Adventure Upgrade. All active members are put in the draw each month automatically. How cool is that?! The gear in each box is true to the outdoors. You receive items from these categories: Gear, Apparel, Food, Skin Care, and Emergency and Medical supplies. Therefore, when you become an active subscriber you have the ability to cater your box to your personal preferences. This is a unique feature the other guys don’t have. Simply fill out your profile with your favourite outdoor activities, clothing sizes, food/drink preferences, and even details regarding your four-legged companion if you have one. The ability to have the box curated to you shows how much the company cares about your experience. Not to mention the rewards program mentioned earlier. Cairn offers two boxes, The Original Monthly Box and the Obsidian Quarterly Box. The monthly box ships out mid-month. The Quarterly Obsidian box ships out the first week of March, June, September, and December. Prices are USD and includes free US shipping. The Original Box shipping to Canada is $5 USD; $10 USD for International. The Obsidian Box is billed at $199 quarterly. Shipping is $18 to Canada; $36 International. All options have the ability to gift to anyone you like, but keep in mind ALL subscriptions whether personal or gifts are renewed automatically (cancel anytime). Gear Pack is great for Canadians due to no exchange rate or border control, that said shipping will vary depending on your location. You can choose from a variety of box sizes to fit your budget and every subscriber is entered into a monthly gear giveaway. My total investment for the box and shipping is $39.90 CAD. Your shipping rates will vary. Sportsman’s Box is for the true hunter and fisher. And if that’s you then definitely look in to this subscription. However, it’s quite a bit pricier than the others and shipping is not included to Canada, so keep that in mind. If you pay up front for 3, 6, or 12 months it’s a better value than simply doing month-to-month. Consequently the large lump sum up front isn’t budget friendly… for me anyway. Also, don’t forget about the exchange rate! For example, $39.99 USD + (estimated) $15 shipping that’s roughly $72.25 CAD at the time of this article. Ouch. Cairn is a perfect contender in the monthly subscriptions services, they provided curated gear related to anything outdoors. The fact that they personalize your box(es) and have a rewards program for reviewing and referring friends is impressive. Plus a monthly giveaway that all subscribers are entered into automatically, how can you go wrong? Most of all, the investment isn’t too bad at $25/month USD plus $5 shipping to Canada. Therefore $30 USD is roughly $40 CAD, right on par with Gear Pack. That said, Cairn offers more value with their Cairn Points reward system. Ultimately the decision is yours and I hope I’ve helped you decide which would be a great monthly subscription box for you. Do you already have a favourite subscription box or looking to change it up? Let us know in the comments below! Thank you for reading! CanuckSurvival.com is for educational use only. Use survival techniques and equipment at your own risk. CanuckSurvival.com and its authors will not be responsible for any injury, death, or consequences of any actions taken on the basis of the information provided throughout this website.